for the ZIEGFELD FOLLIES and WINTER GARDEN THEATRE Extravaganzas! featuring Colte Julian, baritone, Bernadette Boerckel, soprano. Overture to the Ziegfeld Follies of 1915. “Was There Ever a Night Like This? ” (from The Passing Show of 1912). “Hello Frisco!” (song from the Ziegfeld Follies of 1915). “‘Neath the South Sea Moon” (from Ziegfeld Follies of 1922). “My Rainbow Girl & The Alimony Blues” (from The Rainbow Girl, 1918). “My Home Town” (from My Home Town Girl (1915). “Any Old Time At All” (from the Ziegfeld Follies of 1918). “Mary” (from Geo. M. Cohan’s Broadway show Mary,1920). “When I Hear a Syncopated Tune” (from Ziegfeld Follies of 1918). “Cupid’s Lane” (from The Revue of Revues, 1911). “The Wedding Glide” (from The Passing Show of 1912). “Wildflower: An Indian Intermezzo” (1908). “List’ning on Some Radio” (from Ziegfeld Follies of 1922). Highlights from Going Up! (1917). “The Ziegfeld One Step” (from the Ziegfeld Midnight Frolic, 1915). From 1907 until his tragic death in 1924, Louis A. Hirsch (b.1881) was one of America’s best and most famous theater composers. During that short period, Hirsch’s more than forty musical comedies, operettas, and revues surpassed – in terms of critical praise and public interest – the work of his much better-remembered rival Jerome Kern. In the 1910s Lou Hirsch was the toast of Broadway and London’s West End, and the songs he wrote were the ticket to success for many rising stars (among them, Al Jolson, Will Rogers, W.C. Fields, Mae West, Eddie Cantor, and dancer Martha Graham). Yet today, for reasons having everything to do with two mighty revolutions in entertainment technology, Louis Hirsch and his marvelous music are all but forgotten. Hirsch pioneered the classic “show tune” as we know it today. He was also the first composer to bring the “Blues” to Broadway – a year before even W.C. Handy had broken into print. 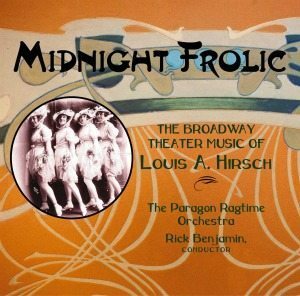 To audiences of the 1910s, Hirsch’s raggy music was sleek and sensational; modern listeners will discover him to be the delightful “missing link” between Victor Herbert and the Jazz Age. Louis A. Hirsch’s influence is just now beginning to be understood, but it is not an exaggeration to say that without him, the music of Broadway’s “Golden Age” could not have developed in quite the glorious way that it did. This album includes a forty page booklet packed with historic photos, the first comprehensive Hirsch biography, and lists of his Broadway productions. "...genteel melodic lines swim like fish through pure water."